I have always been someone who has yoyo'd a bit with my weight, trying different 'diets' but never keeping it off as they were always that-a diet- rather than a way of life so I would always go back to bad habits. I knew I had to change habits/lifestyle if I was going to make a difference which needed to include food and exercise. I had worked with Lorna before when she first started out in Bath and loved her ethos. It was the first time for about 15 years I had taken part in any group exercise but she always made you think you could do it AND achieve more. That's why I really wanted to try her kickstart programme when I heard about it. It sounded perfect for me as I could do any exercise at a time convenient for me but still hear Lorna's motivational messages and get her support and advice despite now living 150 miles away!! During the programme I felt that she was always close at hand, only a call, message or Facebook page away if I needed help or steering back on track. I also found the group Facebook page really supportive from both Lorna and the other ladies on the programme. Despite not knowing any of them we quickly felt confident to express our weaknesses, share our successes etc in a very supportive environment. Even having completed the first 8 weeks we still all check into the group page sharing meal ideas, goals reached etc. I really enjoyed the programme and it got me back into exercising at my own speed, pace and ability. I could push myself as hard as I was capable of rather than worrying about what others were doing around me. 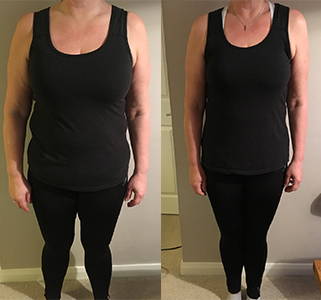 After the first couple of weeks I could already feel that I was less lethargic and had more energy, at the 5 week mark I was really surprised that I had lost 21cm from different parts of my body and by the end of it 37cm. Around about the 6/7 week mark was when people started to ask me what I was doing! I now feel that I have got into lots of good habits. Occasionally I make a bad choice but so much of it i do without thinking. The biggest change for me is having breakfast every morning which has got rid of my 4/5 o'clock danger mark! I have a new repertoire of recipes which are now my weekly go to meals thanks to Lorna's support and the other girls and lots of lovely food which is tasty, healthy and isn't 'diet'! Just get started. Don't let the little negative thoughts telling you that you 'can't do it' or that you will 'fail again' get in the way. Ignore self doubt and just start. Once you get going, you'll realise that you can do - plus with Lorna cheering you on, failure is never an option! Were you inspired by Kirsten's story? If so why not start your own journey?